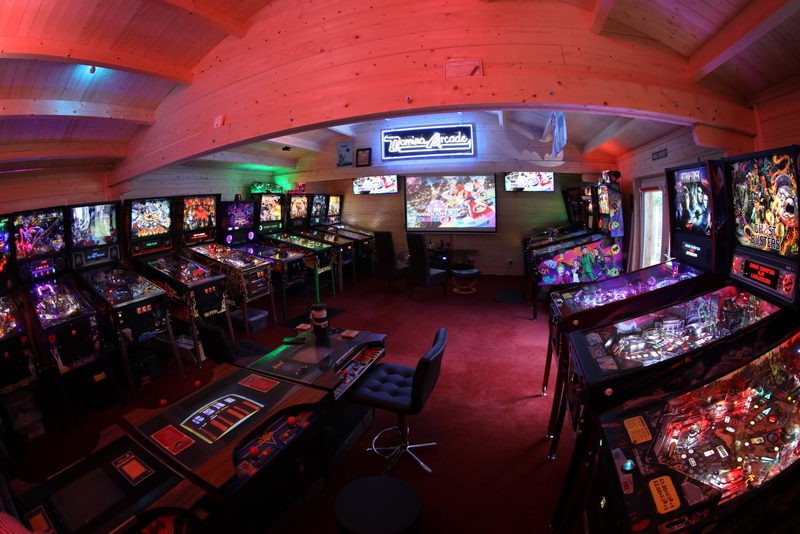 Managed to squeeze 8 pins into the gamesroom along with the pool table. Can still get around the pool table easily enough, Spider man now with Tron, which was all on it's own earlier. Importantly it means a space has been made for LOTR LE coming this week. WCS still in the company hallway and my in-slow-progress TOMS in my workroom. Finally got the last flyer to frame in the games room for all the machines I've had at home or in the office. I'm really glad I was able to get them, having one missing would annoy the sh*t out of me. 22 different machines, I know thats nothing compared to some, or even some in one week (saying nowt Mr Riley). I like the idea of keeping flyers for machines owned, I may start that. Pretty sure @Matt Adams has had the most machines here ( 300+ apparently ) , please correct me if thats wrong. Actually, @steve brum could well be way past that? I'm upto 36 in 6 years. 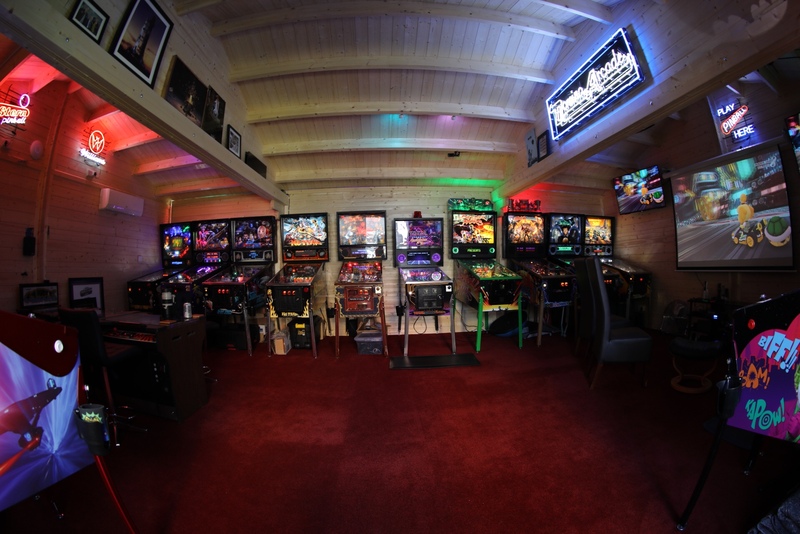 I'm on 59 machines but that is since 99 and had a break in early to mid 2000s as was heavily into vids then and pins fell by wayside to some extent mirroring the shift in the pinball manufacturing output and quality or lack of at the time. I bet you try to sell me a pool table on Friday afternoon ! LOL. No, it's a constant reminder that I mustn't go crazy, I suspect I will when I have more room. I'm enjoying have a work room though, been buying lots of tools and stuff. I'll reorganise to house a few, the first TOM is about done, just he main project to do. It's only a matter of time before the pool table goes to make way for more pins. It's pointless fighting it, pins always win in the end. Just buy a pool themed pin....... Problem solved ? Also my first TOM is a weekend away or so away from being done, which was a refurb/revamp. Then I'll just have the major project of the super minty all new TOM to do - and I can sell one of them. Spiderman and Tron other side of the room. WCS in the hall and two TOMs in the work room. 6 of these have Pin Stadium and are pretty maxed out bling & mod wise. Awaiting Toppers for Spidey, TZ and LOTR from Dan at Tilt Topper. As ever, happy to let people play them if they're somewhere near M1 J40. Up to 4 games so far since I came back into pinball, I don't look like stopping anytime soon. OCD L00NZ watch out! major OCD blood vessel busting coming up! That’s like stroking a cat backwards, you mentalist! Meteor looks in great nick though. That’s like stroking a cat backwards, you mentalist! So, you found one - awesome! From USA? Yeah I think I am going to move it next to TNA Lee found it in Europe - it’s in superb nick with all new boards. The spinner needs some adjusting but it plays beautifully! It looks like the cocky wee gobsh!te at school that had his two big brothers backing him up ? I'm sure it will look much more at ease next to TNA. My main line up, TZ finally with it's natty LCD dsplay. Iron Man sold today (lovely thing) but I have my newly powder coated Metallica to go in its place. Not shown TRON. Order an Iron Maiden Premium (will get mirrors and shaker plus other mods). Iron Maiden will go in this line up and TAF will go other side of the room until I can convince Dan at Titltopper to do a new TAF topper, it's topper looking a little dated, the machine itself is lovely. Haha that doesn’t get me since I know they are good. Currently TAF has me itching because of its old topper, line up will look different after Iron Maiden comes. All will have toppers by Tilt Topper. TAF will be in othersude of the room. Great toppers, have the Iron man one, going to get a couple more, anyone want to share the postage? i'm in the US in october ian.... I'm going to get a couple I think. Dug my fisheye lens out! Thanks to @chris b, @lee riley , @stoptap, Tobin and Martin for the machines and help! Moved earlier this year and now have a dedicated pinball room - just wish I could squeeze a few more in! That's a cool topper on LOTR . Never seen one like it before ? All these images are just fantastic to look at. I can only imagine what they are like to own them.